I just love the cartridge Simply Charmed. It has a little bit of everything. I just thought the baby girl in this carriage was cute with her little face peeking out. I won this crinkle ribbon from My Craft Spot stamp release party. I must say I love it!! So adorable Tara. Love the added stitching. Very cute! Love the sparkle and stitching! What an adorable card! 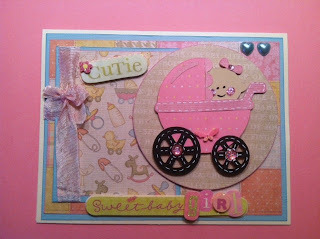 That baby face is so sweet.--Pat N.
This is an adorable baby card. I love it. Beautiful. Thank you for following my blog. I just joined yours. This is so sweet! Your doodling is a wonderful touch - and such great paper too! So cute! Love all the little details you added. Thanks for playing at My Craft Spot. This is adorable! The little baby is so cute and the doodling adds a nice touch! The Crinkle Ribbon looks great too! Thanks for sharing it with us at My Craft Spot! super sweet.love the patterns and colors.